High-speed internet access is provided with each workstation and secure wireless access is available throughout the facility. 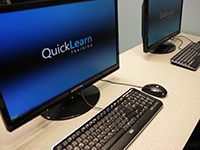 The QuickLearn technical staff will set up classroom computers based on your requirements. A variety of PC compatible operating systems are available including Windows 7, Windows Vista, Windows XP and Windows Server 2008. 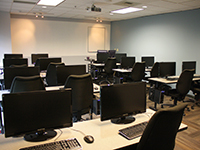 Our staff can have your software installed and ready to go before class begins. Technical staff will be onsite and available throughout the day. We're conveniently located in Kirkland, Washington, just a few minutes from the Microsoft campus. Our training center is within walking distance of major hotels with numerous other options only a short distance away. Our facility has ample free parking and a Metro bus stop directly in front of the building. Students will have access to our well stocked break room throughout the day. Coffee, tea, soft drinks and juices are included in the classroom rental as are morning and afternoon snacks. There are more than a dozen restaurants within walking distance of our facility but if you prefer to have lunch catered we are happy to make those arrangements for you.